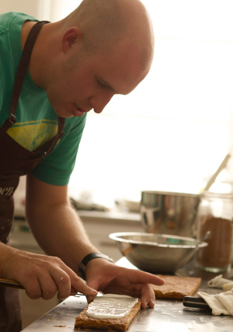 Alistair grew up in Hobart and started his apprenticeship in a local patisserie. Whilst an apprentice Alistair won both the National Bakery medal and Scholarship and the National Pastry Gold Medallist and International Pastry Team Member. After moving to Melbourne and working in various Hotels, Alistair worked at Circa, the Prince where Michael Lambie gave him a recommendation to work for Gordon Ramsay UK. In London Alistair worked for Gordon Ramsay at Angela Hartnett at the Connaught. Upon returning from the United Kingdom, Neil Ferguson (Allen and Delancey NYC) offered Alistair the opening of Gordon’s first New York Hotel and Restaurants, once opened Alistair received critical acclaim for his desserts and particularly his bonbon selection by the likes of Frank Bruni of the Times and the New Yorker. Now based in Tasmania with partner Teena and daughter Matilda they have brought to life their own food destination, a specialised bakery called Sweet Envy in North Hobart offering old time sweets and confections lovingly crafted in small batches evoking the sweet memories of childhood with a modern twist on the premise that food is art.